The NAD DAC 2 Wireless USB Digital-to-Analog Converter turns computer music into high-fidelity sound. This simple solution lets you listen to any music stored on or streamed to your computer on your hi-fi system. Point-to-point wireless technology means you can just plug in the two-piece DAC 2 and start enjoying computer audio with the least amount of fuss. You no longer have to pick your computer over your audio system when it comes to listening to your favorite digital tunes, Internet radio, or cloud services like Spotify, Pandora, Last.fm, and MOG. Spoil yourself with better sound quality and more control over your music choices. 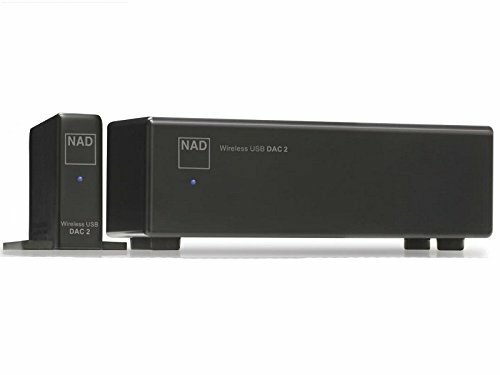 The NAD DAC 2 becomes the sound card for your computer, and with 24-bit 96kHz digital capability anything you can hear on your PC, including Studio Quality HD Audio, is digitally transmitted to your Hi-Fi! Several smartphone apps are available to remotely operate your PC or Mac. You don't need a Wi-Fi network to enjoy Computer Audio at its finest. To achieve the best possible sound, the Transmitter digitally transmits the audio from your Mac or PC to the DAC 2 Receiver, which then converts the digital signal to analog using a premium Burr-Brown chip with 24-bit/96kHz DAC with selected passive components in a proprietary circuit. There is also a coax digital output that allows the digital processing to be done in your A/V receiver or preamp/processor. The DAC 2 is an easy, economical solution that doesn't compromise NAD's incredibly musical sound and promises to boost your enjoyment of your existing component system. The DAC 2 brings a whole new world of musical experience and choice to your hi-fi experience. Wirelessly Stream music from your own collection and Internet music services with 24-bit/96kHz studio quality, with no Wi-Fi network needed!